For reasons I won't explain, I have suddenly found myself in the unexpected position of being able to buy two of my "most wanted" watches in a very short space of time. One is on the way but that's to remain a secret until the Bristol GTG. That said, at least a couple of you know already! The other target is a Heuer Bund. As usual I started my research on ATG, reading the posts, following the links Al has kindly posted, studying the books etc. I started to wonder why certain watches advertised on forums took many months to sell. Then guess what, my legal training kicked in and I started noticing differences not mentioned elsewhere and drawing conclusions - aargh! The same thing happened with my Russian Strela research but this is much worse, after all we are talking thousands, rather than hundreds, of US$. After what possibly happened with "Dave's BBC Lemania", (grabbed by a lurker? ), I'm not going to link or refer to any Bunds currently for sale. One point of detail is the right chrono sub-hand, I have seen both the very first and last with the same hand - have a look in Konrad's book on page 574 or the Lightning mook on page 119 - it has (I don't know what the correct term is?) a "tail". Then there is the "cut-off font", i.e. the sub dials cut off part of the numbers. I thought that the rationale for these dials was that they were Sinn redials but then again, now I'm not so sure! It is the Sinn refurb's that really created my doubt. When you really start looking at these Sinn watches the difference becomes quite noticeable. I actually really like the Sinn branded 3H - the name and red circle seem perfectly proportioned and placed on the dial. However, am I right in thinking that a lot of the Sinn branded and refurbed Heuers sold by Sinn direct were obtained from the Luftwaffe in tired condition, refurbed by Sinn with new dials, hands, bezels, crystals etc and then sold direct to the public? I.e. there's not much original mil-watch left? I gather Sinn had a contract to refurb 600(?) of these Heuers but presumably they would have been given many, many more, to try to use as many salvageable parts as possible, just like a quartermaster will give a box of broken watches to a his assistants and order them to make as many working watches out of the broken ones as they can, i.e. mil-watches are treated in the same way as any other tool or piece of kit. The very design of the 1550 with those four screws on the back encourages this "maintenance". So how do you figure out what is in "as issued" condition and what is a former Luftwaffe watch which has been restored for the civilian market? 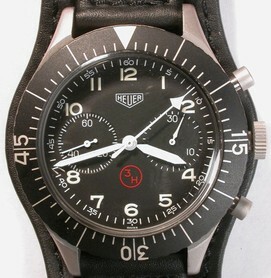 To complicate matters further, it seems that Heuer also sold these watches to civilians! After all, why limit your potential market? This might go towards explaining why some watches have both 3H and a tritium "T" on the dial? I have seen it suggested that the military would only require 3H but the "T" might be required for civilian applications, or perhaps be something to do with a statutory requirement relating to the use of tritium in the manufacturing process. Sterile dial (non 3H) Heuers have definitely been issued though. So where does this leave us? I reckon either try to find one like Al's (no surprises there then!) which is original or, if you go for a Sinn refurb, whether branded Heuer or Sinn, perhaps the sensible (and safest?) choice is one with double issue marks and a 3H dial? Why? If Sinn had hundreds or possibly thousands of these Heuers, the 600 would have gone back to the Luftwaffe and Sinn kept the remaining parts, turning them into complete watches. I'm guessing the 600 would have been reissued and possibly given a new, second issue number, whereas those watches left in stock were sold off to the public, presumably leaving the existing issue number on the caseback, partly because it would appeal to the buyer, partly because it meant less work and partly because they were in stock and ready to go if the Luftwaffe needed any more? I'm not suggesting that none of the other, non-600, watches were not returned to the Luftwaffe, just that it's probably more likely that one with double issue marks was returned. P.S. This has made me appreciate my 757 UTC even more. am away at the moment and had a breif look at this... my nose started to bleed so with get back to it when back at my office when my blood pressure is back up! Hmm, guess it was rather intense - to think that was all inside my head! Cathartic exercise over, all is clear. Funnily enough, a Sinn branded 1550 popped up for sale shortly after my post, which helped clarify matters for me. I have made a decision and hopefully I should have my 1550 SG in time for the November GTG. As to whether it's Heuer or Sinn branded, you'll have to wait and see. I'm no specialist on these watches, so please don't take my word as gospel on this. Nevertheless, it has always been my understanding that original Heuer-sourced dials were recognizable because the numerals were not cut by the subdials (left), while the dials replaced by Sinn during service had their numerals slightly cut off (right). 3. Refurb by Sinn but not returned to the Luftwaffe and sold to the general public. Anyway, I'm not going to lose any more sleep over this conundrum! Figuring out what meets your requirements for appearance, originality and so forth is one of the fun bits of where you pitch your collection. Personally, much as I love the Bund, I always preferred the 156 (I would, wouldn't I). No military connections at all, but a great watch nonetheless. Actually, I'd rate the "no military connections" assessment as a bit strong. Okay, "no military connections" is a over-stating it a bit, but what I wanted to convey was that it is not an issued piece, which mine isn't, a property it has in common with all the other 156s, because they weren't issued pieces (despite having the additional functionality of a bezel over the PD/Orfina). As a non-issued piece the attraction and value of the watch is based entirely on its condition, and no relative consideration of issue or originality at point of issue, which all issued pieces carry with them as valuable or detrimental baggage. My 156 has a new bezel, crystal, dial and handset courtesy of a full service at Sinn, and its value is increased as a result, as it makes the watch better presented, and also more usable for being more luminous. Doing the same thing to the Heuer Bund detracts significantly from its value. For me it is a bit of a shame that the 156 is often stated as the "nearly Bund" watch, it has a lot of merit without this failure to win the contract. A Heuer Bund recently sold on ebay with the classic 3H dial and small T, plus double issue marks on the back. So what you say? Well, as I mentioned above, Sinn had a contract with the Luftwaffe to refurbish these watches and replace the tritium dials. 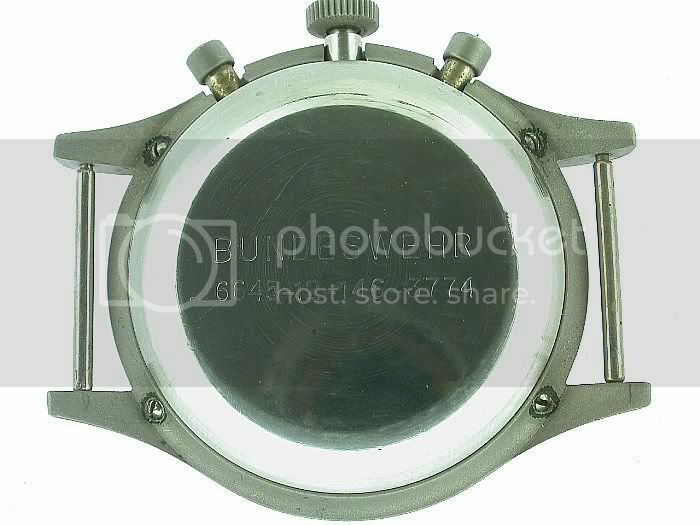 Military watches such as bunds have a NSN (Nato Stock Number) engraved on the back. On an early Bund the number is...hold on a minute whilst I take mine off to check...6645-12-146-3774. What does the code mean? 6645 means watch - every piece of military kit from watches to water bottles has its own NSN. 12 is the country code - in this case Germany. 146 is the manufacturer's model number - that's why my Hanhart 417ES has a different NSN to Al's; this third number on mine is 120 whereas on Al's 417E it is 121. I have read that the last number is the manufacturer's number but that cannot be right, since this last set of numbers is different on my Gen 1 and 2 Seikos. The last two sets of numbers are just the item number then. So, is the reason why many Sinn refurb Bunds have the 6645-12-146-3774 scored through and then a different number engraved underneath (6645-12-340-9456) because the additional NSN underneath reflects the fact that it was refurbed by Sinn, hence the last two sets of numbers being different, with the Sinn refurbs given a distinct model number? There are Sinn refurbs (ie non tritium with no "T" marked dials) around with one set of numbers - there's one in Konrad Knirim's excellent book on German military timepieces. Equally, like the one on ebay, there are non-Sinn refurb (ie tritium "T" marked dials) around with two sets of numbers. Appearing in a book does not automatically guarantee authenticity although Konrad is one of the very best. Watches were kept in the stores and when they became broken, the QM would cannibalise broken watches to make as many working examples as possible, so parts could well have become mixed up, rather like a racing car team using parts off a crashed car to keep the other cars going. This is particularly easy due to the construction of the Heuer with just four screws holding the movement in place - a brilliant design for the military. In addition, like an old racing car, these Bunds probably fell into a period of the doldrums when they were cheap military surplus - civilian owners would have had no qualms about swapping parts, particularly casebacks which are easy to swap - you used to see many Bunds with their caseback markings removed, although now that sight is rare. What I am trying to do is determine some logic to the variations. The only way we will probably ever really know is by speaking to the Luftwaffe personnel in charge of stores. I reckon my conclusion makes sense and that variations are due to later parts swaps, either by the Luftwaffe or subsequent civilian owners. 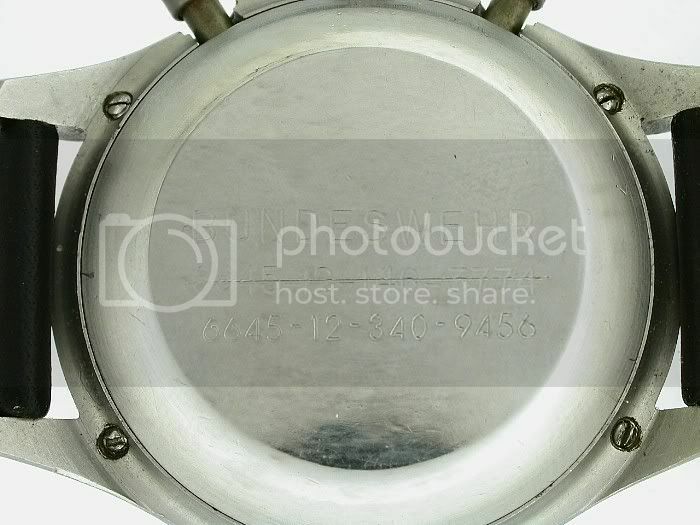 The caseback engravings on both of Zaf's two Bunds a Classicwatch.com make sense, as pictured here - double issue marks for the Sinn refurb with cut-off font dial and no T, plus single issue marks, no cut-off font and the small T for his original, non-refurbed example. All this conundrum is why I went for the classic 3H, small T dial with single issue marks but my other option would have been Zaf's Sinn refurb with double issue marks. Photos borrowed from Zaf at Classicwatch.com - highly recommended! Last edited by StampeSV4; 07-11-2009 at 09:45.